Our transit planning team carefully reviewed thousands of Edmontonians’ comments about the proposed new bus network. In summer 2018, the planners used this feedback to make adjustments to about 20 percent of the proposed bus routes. Planners are currently reviewing feedback gathered in fall 2018 and may make minor changes where warranted before presenting the final draft to City Council for approval. 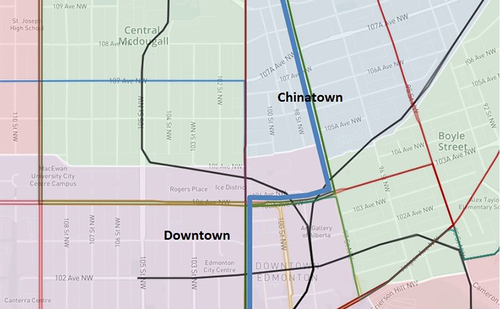 Before changes were made to the new network, they were evaluated against Transit Strategy guiding principles, potential number of riders, benefit to the most Edmontonians, connection to important neighbourhood destinations, and impact to overall budget. Each year, ETS moves some service from underused routes and trips to better serve higher demand routes. Using set standards, we look at neighbourhood population, current number of riders and potential for future riders. By improving the reliability or frequency of service on higher used routes, ETS expects to attract more riders overall. The new network is based on connecting more people with popular neighbourhood destinations. Improve efficiency of the existing service using the existing budget and available service hours. Where warranted, we adjusted routes to reduce walking distances in many communities. In most cases, Edmontonians will need to walk 5 to 7 minutes to get to the nearest transit stop. The walking distance map shows the increase in walking distance compared to what you residents are walking to get to a transit stop today. Direct link connecting Fulton Place and Gold Bar communities to Downtown (bold red route). 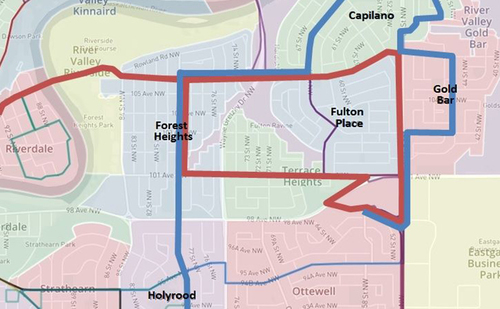 Direct north-south link between Bonnie Doon Mall and Capilano Transit Centre via Holyrood, Forest Heights, Capilano, Fulton Place and Gold Bar (bold blue route). 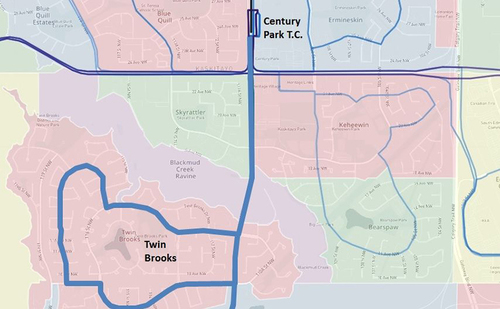 Based on feedback from residents and a review of the number of transit users, we are maintaining a route into the Blackburne neighbourhood during peak periods to connect with the Century Park Transit Centre. See the bold blue route. Based on public feedback, we extended a local route from Downtown to Kingsway Transit Centre via 97 Street, which provides more frequent service to the Chinatown area. See the bold blue route. 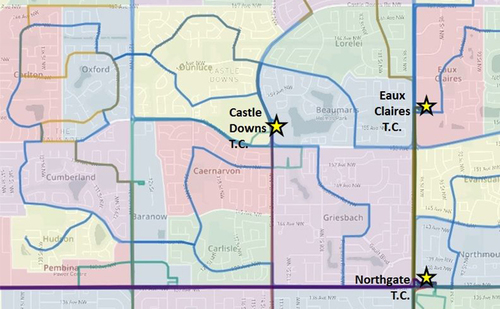 Based on public feedback, we completely revamped bus routes in the Castle Downs area, which now include better connections to the Castle Downs Town Centre. See the blue, gold and purple routes. 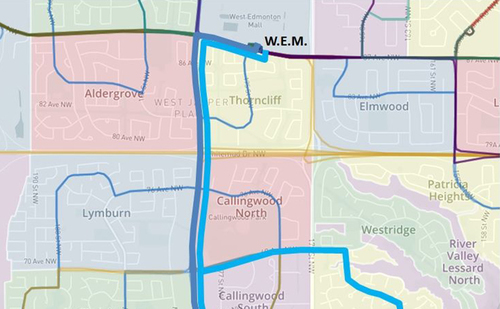 Based on public feedback, we added two new routes connecting West Edmonton Mall with the Donsdale and Oleskiw neighbourhoods. See the bolded blue routes.